A slightly belated look back at my trips to the cycling monuments as they come to my new home province. I can tell you now, add it to your bucket list if you have one – take in a Belgian spring classic and do some riding in the surrounding countryside, it is unique. In search of my Belgian cycling fix I took a day off work on Wednesday ten days ago to cycle down to Huy to watch the Flèche Wallonne. Then last Sunday, my wife and I spent a tourist day in the Ardennes before sneaking onto the roadside in a small town with to see Liege-Bastogne-Liege come through similar terrain. 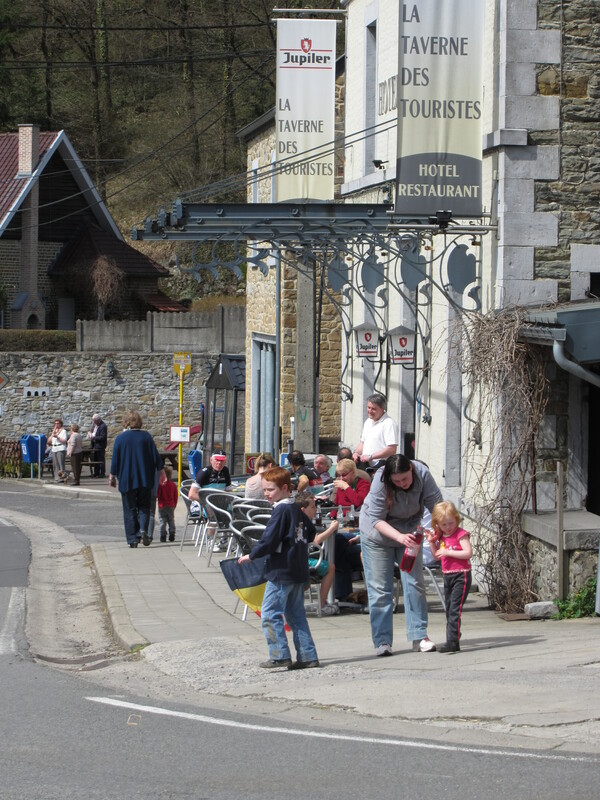 They were very different atmospheres, the football fan fervour of the massed ranks on the Mur de Huy on the Wednesday and then the ownership of the locals in Sprimont on the Sunday as the race came up “their hill”. But both form part of my induction to this whole new world. 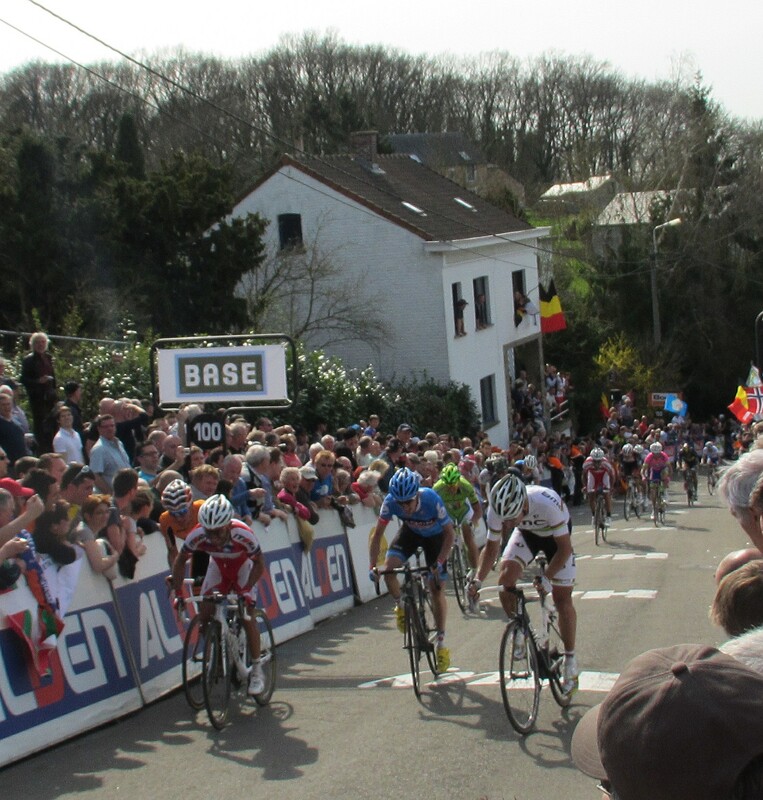 These races are part of what is known as the Ardennes week, with the previous week’s Amstel Gold in the hilly area of the southern Netherlands, then across south Belgium skirting the French border to arrive at the edge of the Ardennes proper in Huy, finally the longest and hardest through the bigger climbs of La Doyenne, (the old lady) Liege-Bastogne-Liege. 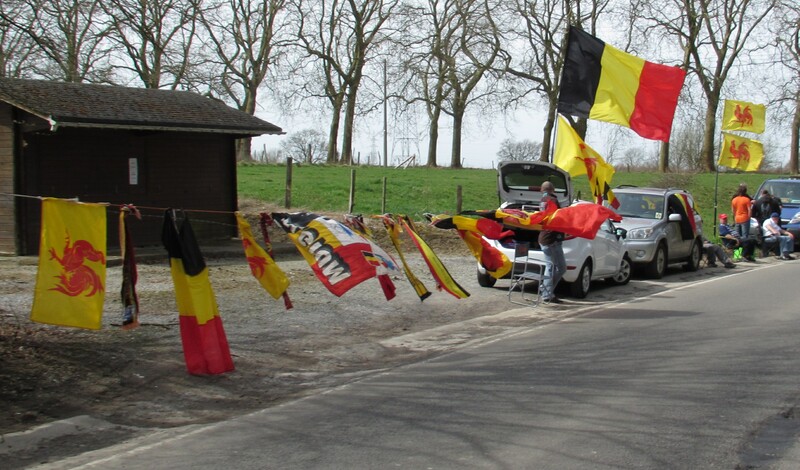 If the Flemish have their days on the cobbles then this is the territory of the Walloons, the French speaking Belgians. The riding has a different kind of drama because these races favour climbers, especially Liege which has been won by most of the grand tour greats in its history and this year attracted riders like Contador, Froome and Nibali who are much more likely to be seen on Alpine passes. 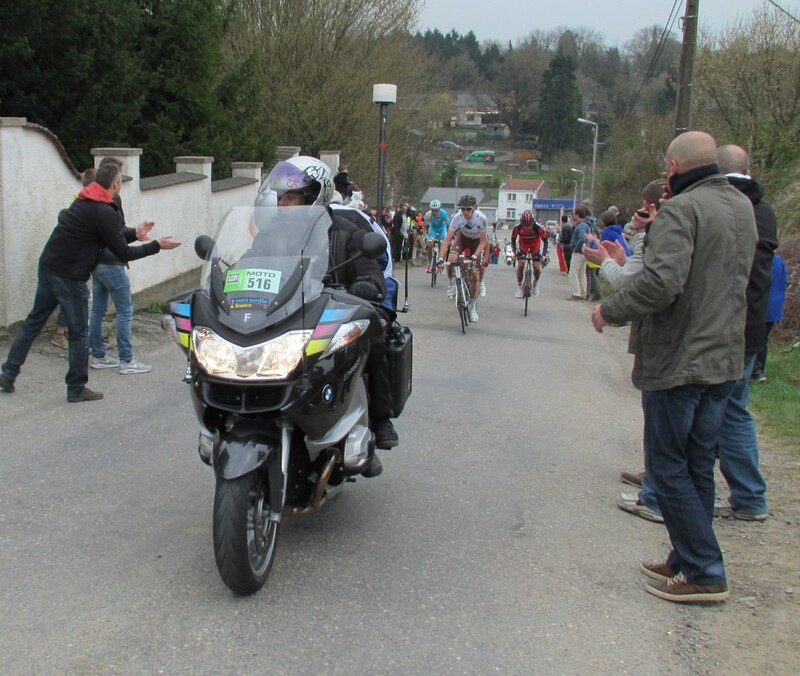 But two years ago local man Philippe Gilbert joined the local heroes when he was one of the very few people in history to do the Ardennes triple, something he has been trying to live up to ever since. Flèche Wallonne, the Walloon Arrow. 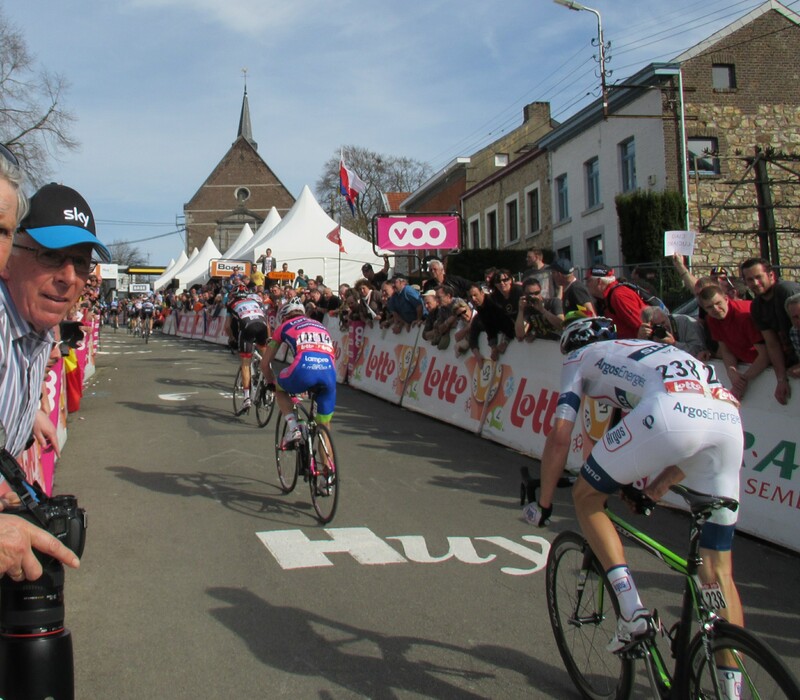 There was quite a different atmosphere at the Flèche compared to the Tour of Flanders (previous post here), not least because it was a warm sunny day with a real sense of spring. Unexpectedly the roads are open to traffic between the race circuits so I was able to ride around part of the course in reverse direction and see the families by the roadside, even the tiniest road junction having someone who had pulled out the deck chairs to sit and wait. And the cafes were bursting with people just taking the sun for a few hours. 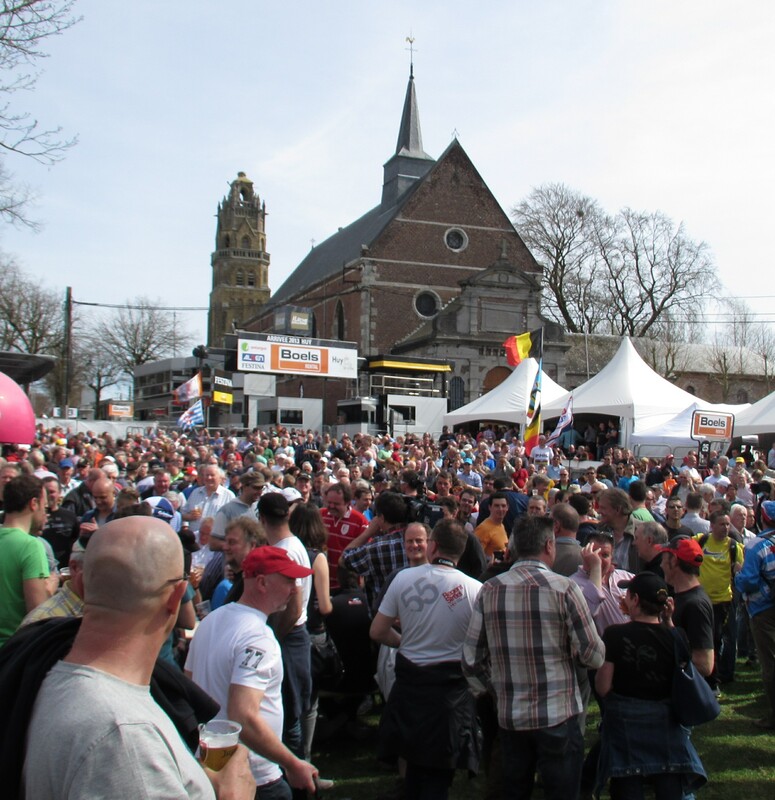 And once I arrived at Huy it was clear that because the race was almost all about getting to the last climb of the Mur de Huy that’s where the big numbers of fans were too. So there was a very enthusiastic and well lubricated crowd several deep against the barriers all the way up and a huge sea of faces looking at the big screen. 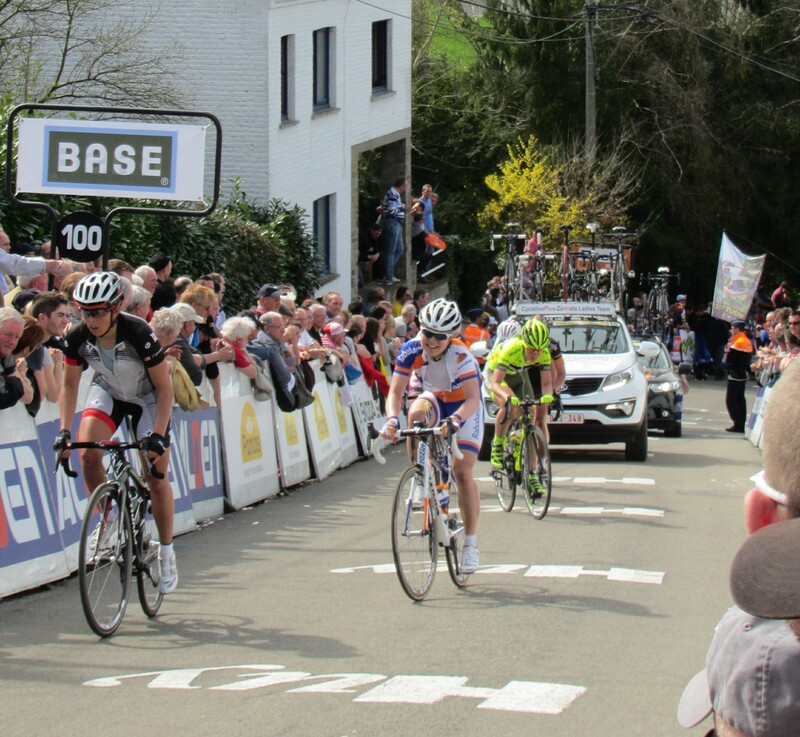 With twice up the climb for the women and three times for the men it really is the focal point for the whole event. The beer tent was doing great business and the frites wagon wasn’t far behind. I felt it my duty to sample both! The other thing that made the atmosphere much livelier was a home favourite. 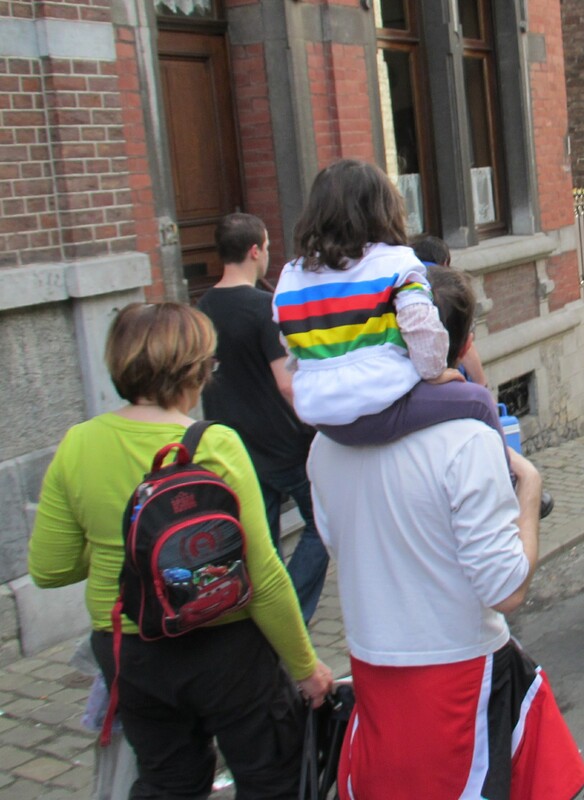 There were a lot of World Champion jerseys around, Philippe Gilbert fan club t-shirts and the fans were willing to burst into chants at almost any moment. It had elements of a football crowd at times, not something I’ve seen at cycling before. The Walloons weren’t alone. I bumped into a few English fans (How do South West Road Club manage to be in so many places at once?) and there was a lot of Dutch being spoken too. Some of them were definitely down from Flanders but also from the Netherlands to cheer the phenomenon that is Marianne Vos in the women’s event. 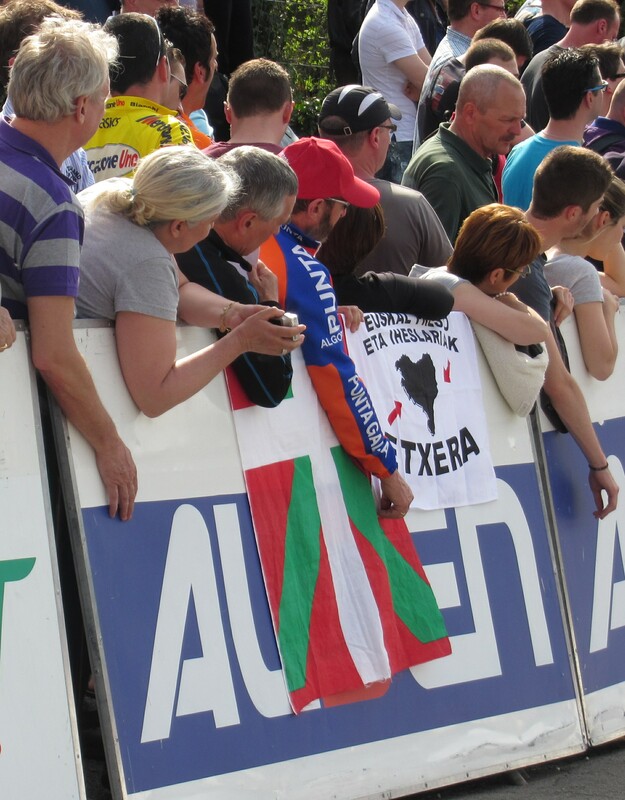 And Basques – that flag gets everywhere, what a region of cycling fans. But for excitement that makes it pretty special. We could see the race build as the first two times established the pattern of the cruising favourites at the front and the labouring journeymen battling to hold the group. 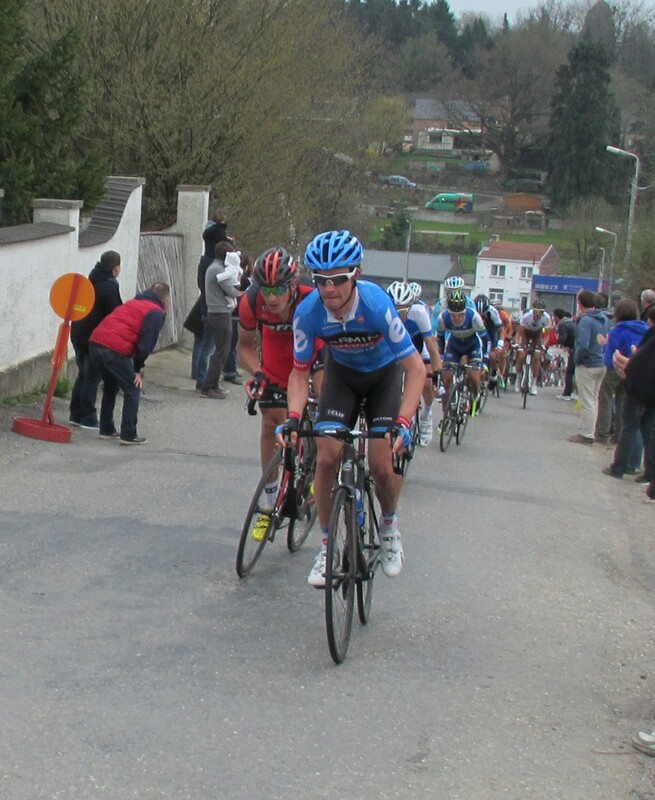 Also because the climbs up the Mur are well spaced the build-up becomes more intense. First with 95km still to go, then just 31 and then the finalé. And in between that as an hors d’oeuvre the women’s race. Vos was pretty amazing, For the women’s finish I was standing where I could see the big screen out of one corner of my eye so I could see the breakaway on the lower slopes. When she attacked it was decisive and she shot by my position absolutely flying for a comfortable win, nobody else looked as smooth. Once she had passed I was able to capture some of the agony on camera, not least Britain’s Olympic star Laura Trott who was discovering that 120km in Belgium is very different to track racing, she was suffering! The end of the men’s race was a very strange affair and it was only when I watched the re-run on the TV in the evening that I understood what I had seen. I got a great spot about 90 metres from the finish, just above the steepest point on the course. The catch was that it because so noisy we couldn’t hear the commentator and nobody knew what was happening. 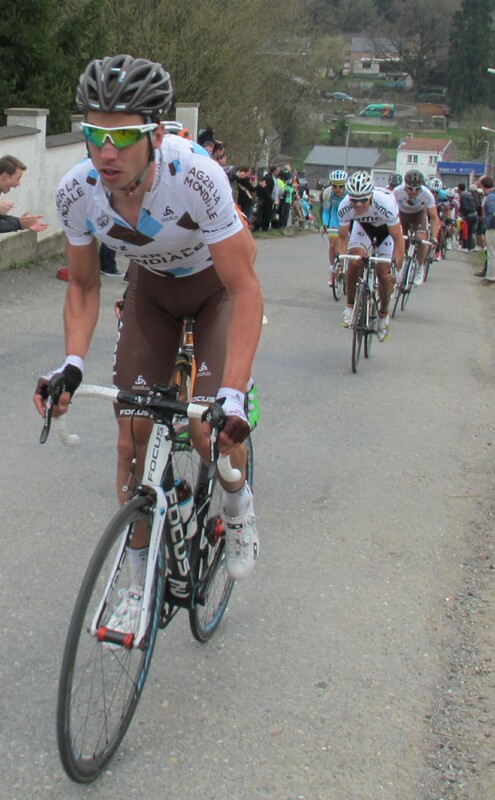 First thing we saw was a AG2R rider round the bend and apparently almost stop. He was so laboured I really thought he was a lapped rider who had somehow got mixed up with the leaders and had nothing to do with the sprint. Meanwhile on the other side of the road a Katusha team red and white rider absolutely flew up the hill making almost everything we had seen before look static. Seeing the red and white I immediately called the win for Rodriguez and when he had passed looked back for Gilbert and company, ignoring the slow moving AG2R rider. The next strange moment was seeing Gilbert himself almost stop, then veer across the road and join a head to head with Anton, Martin and another Katusha..
Then the rest – scatted over minutes and in varying states of agony. But they all got cheered loudly, especially the Belgians. I am so very glad I am not a live race reporter. If it was possible to get a result wrong, then I got it. The flying Katusha was Dani Moreno, who won the race, not Joaquin Rodriguez who was down the hill battling with Gilbert. The slow moving AG2R turned out to be Columbian climber Carlos Betancur who almost become the star of the day as he had blown the race apart on the lower slopes and just run out of gas as he reached us, and he finished on the wheel of second placed Sky rider Henao who I didn’t even notice, he went almost underneath us as I was watching Moreno. However the Gilbert stall was very real, it appeared again clearly on the TV. He explained to the press that his final 15th place meant nothing, it was only the win that mattered. On the TV we could see that he led most of the chase after Betancur on the lower slopes, looks like the hill was just 200metres too long for both of them. A slightly subdued crowd made its way down the hill and merged with the thousands who had lined the route through the town, taking in the hospitality tents and cafes which had clearly all done a roaring trade. I wobbled my way to the station, tired and over-heated. Great day out. 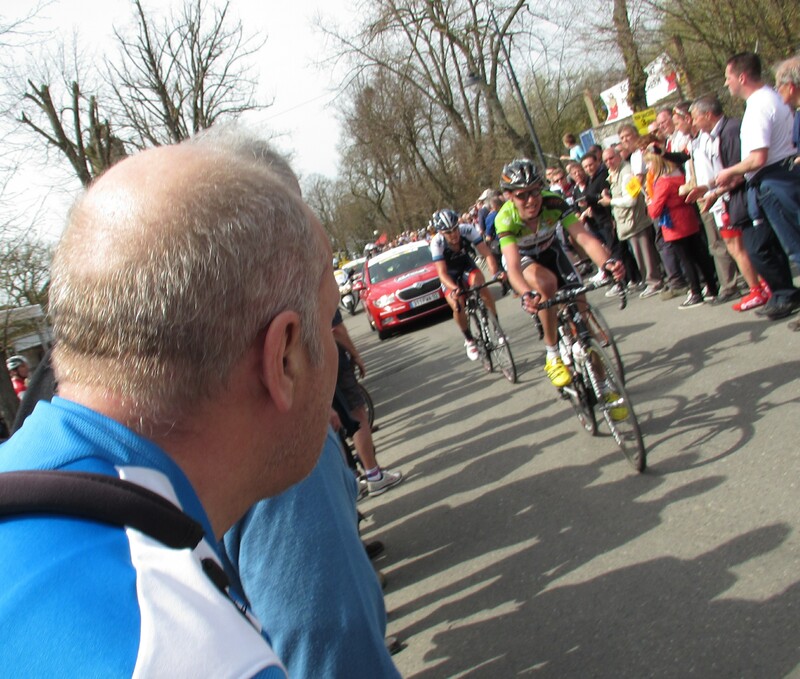 I had a big cycling day on the Wednesday, not only watching the race but cycling for several hours to get down there. In the course of doing so I discovered just how delightful the Ardennes countryside is, especially with our late spring bursting out all over. So instead of repeating my self-indulgent cycling trip I took my wife and the trusty mutt along for a day in the countryside, conceding only that we would end up somewhere significant near the end of the race to catch the flavour. 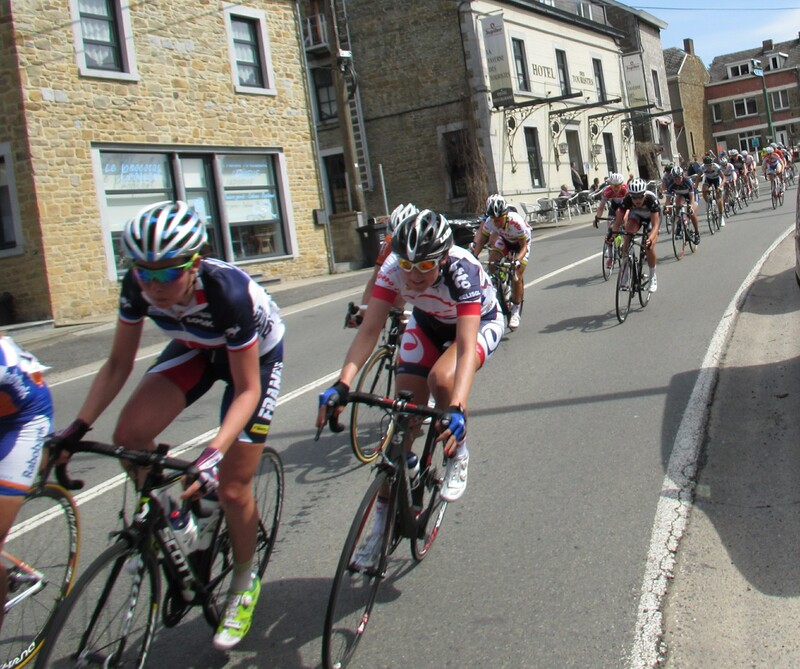 circle around and get ahead of the race and into the small town of Sprimont, 2km over the top of the key climb of Cote de la Redoute, with about 35km to go. At the edge of town we discovered several groups of locals heading for a small corner at the edge of town which turned out to be a narrow steep climb out of the town. most people appeared to be local. There were the homeowners just stepping away from their TVs into the garden, the supremely well organised TV in the car brigade and some of the local chaps just had to keep up tradition by making a very vigorous attack on a couple of cases of beer. I was following the moves on my phone so I was able to anticipate the frantic pace of the race as class group of seven were leading the strung out bunch by just seven seconds. Both groups were flying, Daniel Cunego visible in the break and a Garmin team rider dragging the bunch hard up behind. Biggest shouts of the day “Allez Philippe” of course, but he looked stressed even in the micro-second you get to catch a glimpse of a pro rider going fast. It is astonishing how close we get to these guys, it is no wonder there are the occasional accidents with spectators. We listened to the race play out on the radio on the way home and then saw it again on TV in the evening. We were like small children when we yelled out “there we are” as the race went up “our hill” because unlike the big crowds at the other spots we could clearly see ourselves by the roadside. I guess throughout this spring thousands of Belgians had stood by the side of “their race” in just the same way and been part of it for a day. I was just delighted to be amongst them. 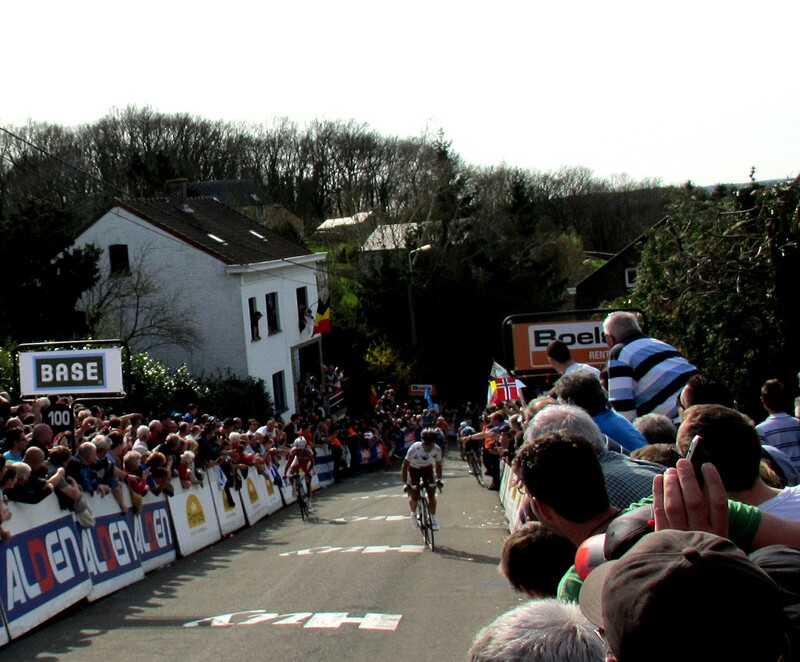 And now it is all over – my first visit to the Monuments of cycling and my first taste of Belgian cycle race culture. I am very sure it won’t be my last. 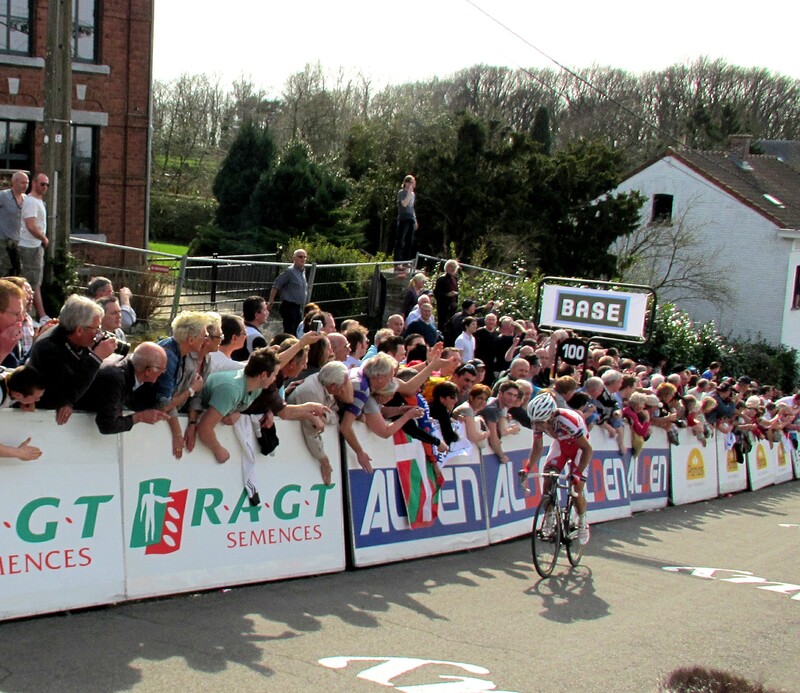 With both Tour of Flanders and Fleche Wallonne using circuits for the final sections the atmosphere and build up on the Paterberg and the Mur de Huy were hard to beat, but there is something great about the locals just popping out in their deck chairs as well. 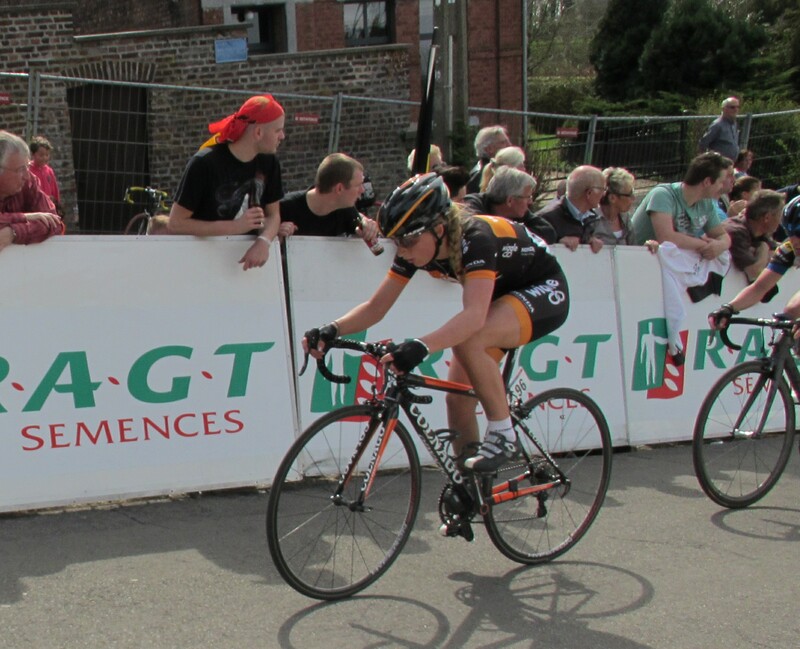 This entry was posted in Life in Belgium, Musings and tagged Belgium, cycling, Dani Moreno, Fleche Wallonne, Laura Trott, Liege Bastogne Liege, Marianne Vos, Philippe Gilbert, photography, racing by kevinmayne. Bookmark the permalink.